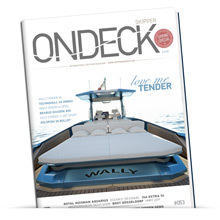 Published in Greece and distributed worldwide (via web) since 2011, Skipper ON DECK is a luxury yachting magazine designed by a group of skilled professionals who have been working in the yachting industry since 2001. 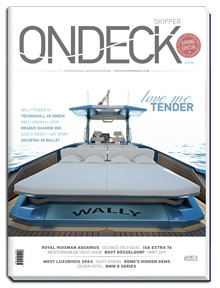 ONDECK covers news from the international yachting industry with emphasis on motor & sailing yachts longer than 10 meters. The yachts featured in each issue are accompanied by technical articles, travel stories, marketing reports and financial analyses by our contributing editors. Establishing media partnerships with the world’s major exhibitions and events, Skipper ONDECK holds a special place at all major industry gatherings. Not only do we get to see and review the latest models in Cannes, Monaco, Genoa, Antibes, Paris, Dubai, but we also maintain a high profile amongst industry professionals. Participating in each year’s major exhibitions is our priority. 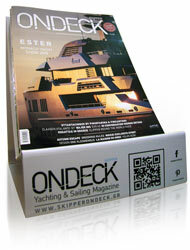 2500 complimentary copies to Premium Charter Yachts (Summer Special) and selected Marinas and Yacht Clubs).